The evening before a crisp, still morning of potentially fulfilling photography reinforces earlier thoughts of the likelihood of recording Mother Nature’s golden light. With the forecast looking promising, the idea of awakening early from a deep slumber is all the more pleasant given I’ve researched my location and used Google maps to my advantage. Casting my mind back pre Google map days, I vividly recall relying more on guess work and vigorously scouting locations after travelling hundreds of kilometres for a keeper or two. But how times have changed for someone like me – a research nut who adores Mr Google’s invention and how it’s allowed me to place myself wherever I wish – almost. When perched in my home office navigating the Monday to Friday grind and attempting to earn a razoo, I cast myself forward a month or two and begin dreaming of “Location, location, location.” My heart begins to race and a clear picture begins to form in my mind. I momentarily find myself imagining where X marks the spot, fiddling with f-stops between 8 and 16, and contemplating which filter to slide into the holder. Again I’m in dreamland and projecting myself forward into the future. Excuse me for a little while as I’m craving to surf the web. I have another X spot to investigate. Hi and welcome. 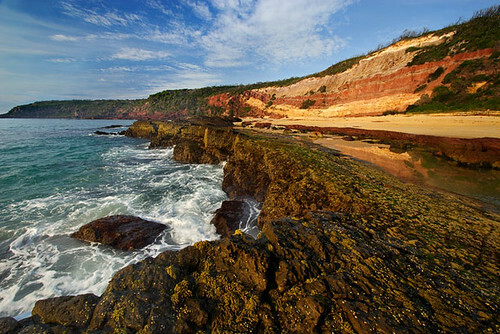 The Sapphire Coast is a pristine coastal area in New South Wales, Australia. 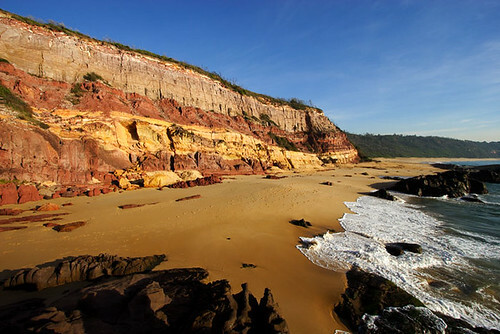 A relaxed resort region ideal for: fishing; bushwalking in national parks; walking barefoot along miles of clean beaches; enjoying coastal vistas from clifftops; and enjoying fresh seafood and a chardonnay. I’ve been visiting the Sapphire Coast since 1988 and it’s always a pleasure to relax in what is my favourite holiday area in Australia. Everyone needs a calendar, and what a beaut gift they make for family and friends. 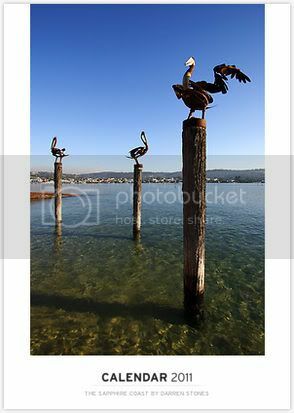 Here is a new calendar I've added to my merchandise range that you may like to consider: The Sapphire Coast. 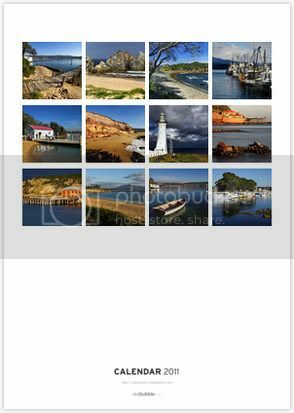 The Sapphire Coast calendar features my travel photography of Merimbula, Eden, Tathra, Bermagui, Mimosa Rocks National Park, Camel Rock, Green Cape Lighthouse, and the historic Merimbula and Tathra wharves. This collection of photography highlights some of the most popular attractions in the region. This calendar is printed on a luscious 200gsm satin art paper at the size of A3 (297x420mm). The calendar has a wire binding ready for hanging. You can select your own start month as the calendar is customisable. If you'd like to purchase this calendar, click on the preview images or links above. For bulk orders, please contact me to arrange a discount. The full range of my merchandise can be found by clicking on the merchandise tab near the top of the page. As a member of blueVoices, the consumer reference group for beyondblue, and Founder of the Australian Travel Photography and Writing group, I'm coordinating the special event, Australians travelling beyond blue. The event is in support of beyondblue’s Anxiety and Depression Awareness Month for October 2010. It is a participation event for individuals to take part in an activity to raise awareness of anxiety and depression, and help reduce stigma. Now in its fourth year, beyondblue’s Anxiety and Depression Awareness Month has become an important mental health awareness event in Australia’s health calendar. You can participate in Australians travelling beyond blue by following the link to where the event is being conducted in the forum of the Australian Travel Photography and Writing group. By being involved, you will be helping to raise awareness and reduce stigma. There is also five beyondblue awareness kits to give away. Thank you for supporting beyondblue’s Anxiety and Depression Awareness Month October 2010. Have fun! Please note: This is not an official event run by beyondblue. I kindly thank beyondblue for granting me permission to use their ADA Month October 2010 logo. Thanks also to Bridget and Emily from beyondblue for their encouragement and support.